This satisfying salad is delicious served warm or at room temperature. Either way, be sure to heat the lentils so that they absorb all the bright, citrus flavours of the dressing. 1. In a large bowl, whisk together the lemon and orange zest and juice with the honey, shallot and olive oil, plus a good pinch of salt and freshly ground black pepper. 2. Heat the lentils in the microwave according to pack instructions. Gently toss them into the dressing, separating any lentils that are clumped together. Add the beetroot and parsley and set aside. 3. Fry the halloumi in a large frying pan set over a medium-high heat for 1-2 minutes on each side, until golden. 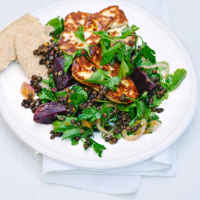 Serve the salad topped with the halloumi, plus some toasted wholemeal pitta on the side, if liked.